Coffee is a huge global industry. Yet the vast majority of coffee producers are small growers who live in some of the poorest countries on Earth. And the journey from the coffee berrries in the plantation to the brewed beverage in your cup can be a meandering one indeed. Everybody wants a piece of the action. From the creditors to the processors, from the brokers to the exporters, these middlemen known to Latin American farmers as coyotes all want a their cut. 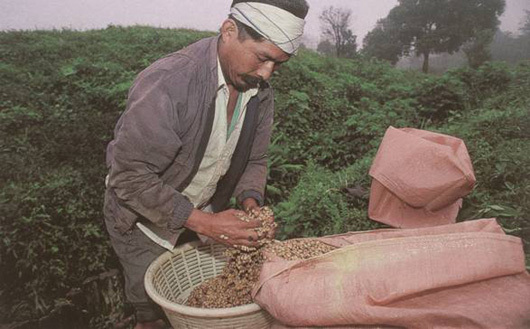 Fair Trade coffee is means of doing business whereby the coffee grower earns a greater profit than the industry norm. This is accomplished by doing away with the coyotes and dealing directly with the coffee producers. Fewer hands in the pie mean more money in the hands of those who need it most. A Better Bean seeks to balance the inequities found in the conventional coffee trade. Coffee is a leading source of income for the Developing World. Through fair trade, it can be a delicious and powerful tool to bring about positive change for small farmers and their families.